Animefringe: Features: OH! Super Milk-chan! OH! Super Milk-chan! - Go Sumiya High School Baseball Team! 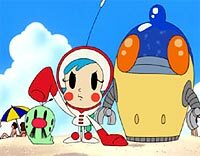 Unfortunately, not many Americans are familiar with Milk-chan, the adorable star of not one, but two anime series and the mascot for Japan's Space Shower TV music television station. Prepped for an American release by ADV, a stateside release for the series has been put on hold by the company. However, OH! Super Milk-chan is a series that many American fans won't be able to do without. OH! Super Milk-chan is the sequel to a 14 episode series Super Milk-chan. The earlier series featured eight-minute-long episodes on Fuji TV, but was able to garner the 30 minute long series. Luckily, AD Vision has picked up both series for release stateside. From its opening sequence, OH! Super Milk-chan's fractured sense of humor is apparent: the entire opening theme song sequence features parodies of 70s and 80s anime, including Heidi of the Alps, Ace o Nerae, and Ashita no Jo. It's obvious the creators of OH! Super Milk-chan! are young people who grew up on such series. The basic premise of the series remains the same each episode: Milk-chan loafs around the house with Tetsuko, a helpful robot, and Hanage (which translates to Nose Hair), when her landlord comes to her house demanding the rent. Milk-chan, very concerned with her bank balance, usually tricks him into leaving, before receiving a call from the bumbling, oafish President who begs Milk-chan to save them all from disaster. Even though OH! Super Milk-chan has much more time than the original series, the episode synopsis above suggests that the anime's actual plot is still tied to that eight-minute mentality. However, the monotony allows for a lot of reoccurring jokes. The helpful Tetsuko is usually reprimanded by Milk-chan calling her bakattsura, which one fansub group translated as, "You baka face!" When Milk-chan answers the phone she usually does a Bart Simpson-like phone gag. Episode one has her answering a call "Yes, General Affairs Section. Can I help you? Just kidding, you know." The joke comes quickly and deadpan so it's easy to miss, but is said again and again (with different places and people, of course). Milk-chan's adventures are equally odd. In episode one, Milk-chan and company have to stop a counterfeiter who is using money with pictures of Japan's oldest twins on it (evidently one twin is the legitimate money, the other twin is the counterfeit). In the second episode, Milk-chan must stop a missile launched at them by the President himself. The art style of OH! Super Milk-chan is very Japanese pop. The characters are colored in bright, neon colors and are outlined in thick black lines, a style which is becoming vogue in American animation as well (just turn on the Cartoon Network for examples). Speaking of which, some might see an immediate link to the American Powerpuff Girls. In many respects the both shows are similar. They both feature super powered girls helping a bumbling authority. However, OH! Super Milk-chan features a much more fractured, adult sense of humor. None of the Powerpuff Girls would threaten to turn a garden hose on a family of ants for not coughing up the rent, to be sure. Nor is it easy to imagine the Powerpuff Girls's Mayor describing his sexual exploits to Bubbles and the girls. Another bizarre aspect to OH! Super Milk-chan are the "Video Diaries," minute-long, live-action clips that feature a school-aged girl narrating aspects of life that end on some quietly off-kilter and unexpected notes. Of special note are the theme songs and ending sequences. I've already mentioned the opening sequences send up of various anime, but the song itself is extremely off kilter. The end song, "High School Rock'n Roll," is a fast paced rock song, which features one of my favorite lines in an anime song, "How long are you going to bully the Osaka governor / before you are satisfied?" The next episode previews are equally as bizarre. 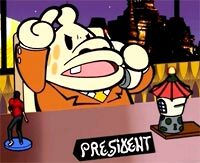 For episode one, the narrator exclaims "The President is in danger! Milk-chan is in danger! Degawa Tetsuro is in danger!" Degawa Tetsuro is a comedian who has nothing to do with the show in the least. Episode two's next episode preview titles episode three as "Go Sumiya High School Baseball Team!" Obiviously, there's no Sumiya baseball team in the show at all. Anyone who enjoyed the humor of a series like Clerks: The Animated Series or Family Guy will be doing themselves a favor in picking up OH! Super Milk-chan. It's a fun series with a cute art style and a great fractured sense of humor.